Do you cook or bake to procrastinate? I do. Today is the day, we are installing quarter round on our hardware floors and it’s my job to paint those strips of wood in our hot garage. I’d rather have flour on my hands instead of paint thank you very much. The only thing saving me is the DVR? Are you with me? Today I caught up with Brain Dead, which is some kind of political comic relief/satire (sort of). I have to see where this goes. Have you watched it? I’d prefer to pretend that life is a bowl of cherries, even if we all know better and we’re all feeling uneasy, no matter what side of the fence we’re on. Alas, even cherries have pits and they are not that easy to get out, so I use a cherry pitter like this one. 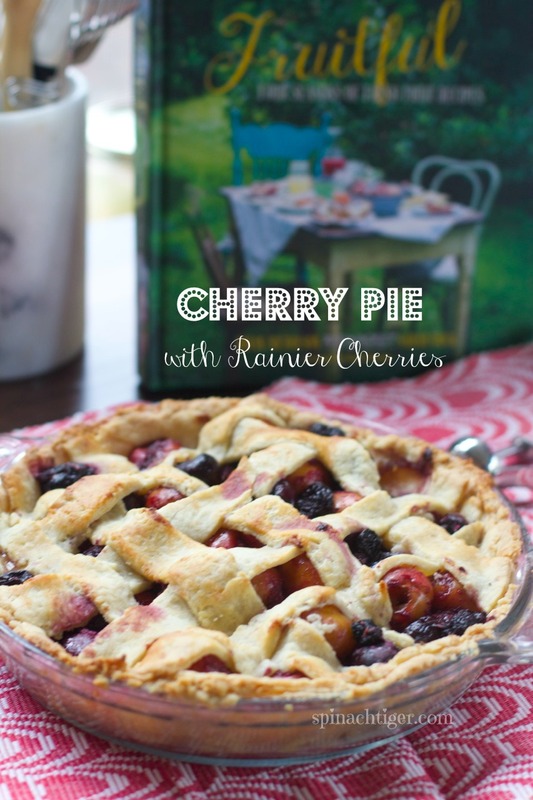 Cherry Dutch Baby is a summer comfort food. It’s a baked pancake very similar to my apple dutch baby that so many of you love. Although this is gluten free, it’s not lesser than, even though it may not puff up in the same way. I made side by side versions and in a blind taste test, Mr. ST like the gluten free one better. 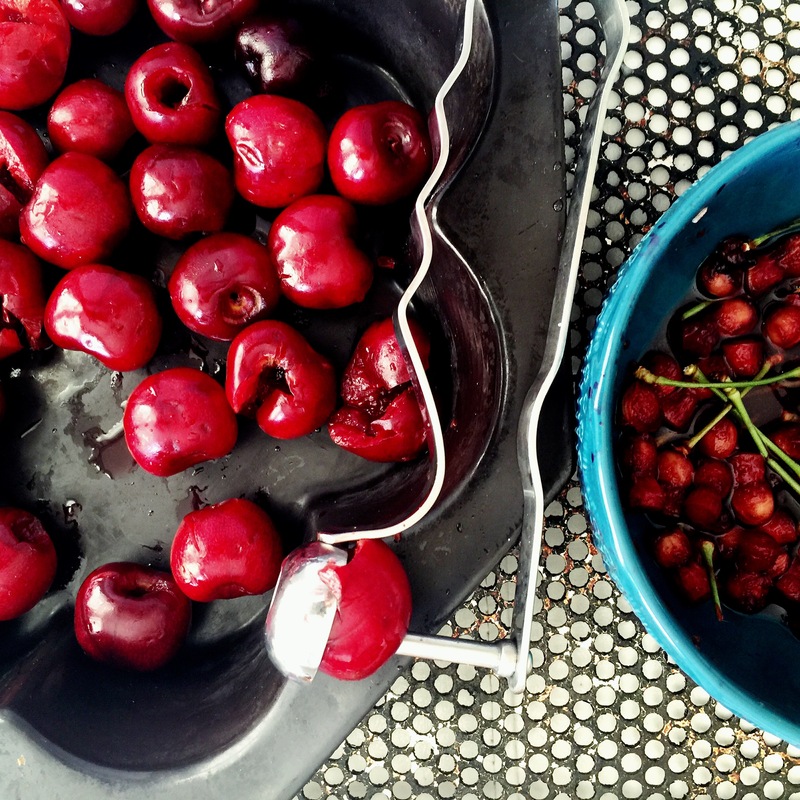 The secret to the cherries is cooking them stovetop with butter and amaretto for about five to ten minutes to soften and flavor. They will be a bit tart, but not too much. If you don’t have amoretto, try bourbon or brandy. They like cherries too! 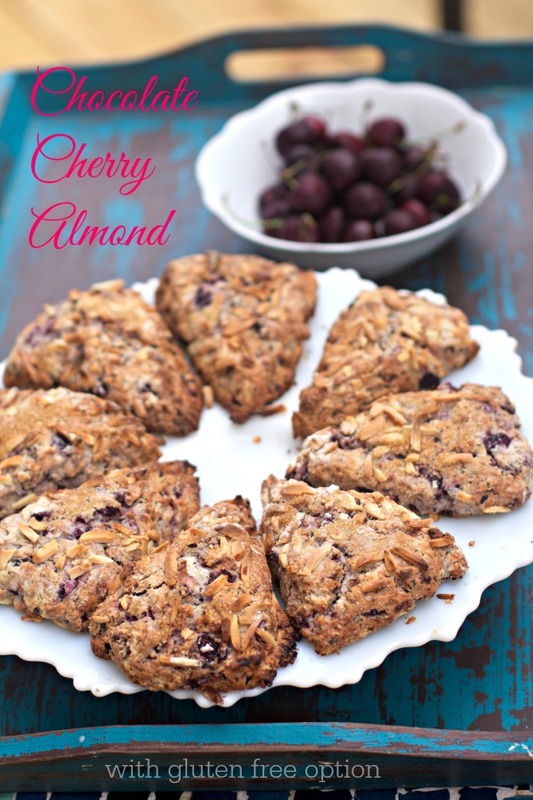 Sliced almonds give the perfect crunch and marrying of flavors, just like these chocolate almond cherry scones. This reminds me of this pear almond clafoutis. I didn’t add the almonds when I baked this. It was an afterthought and I broiled them for about a minute, once the dutch baby was done. Retro Rose called me after taking some home to let me know that her friends tasted and raved big time. So I got four endorsements today for this successful gluten free cherry dutch baby. My testimony is that I had to pull myself away from it, but I have a love affair with cherries. How about you? What’s your favorite summer fruit? See more of mine on Instagram and let’s connect. 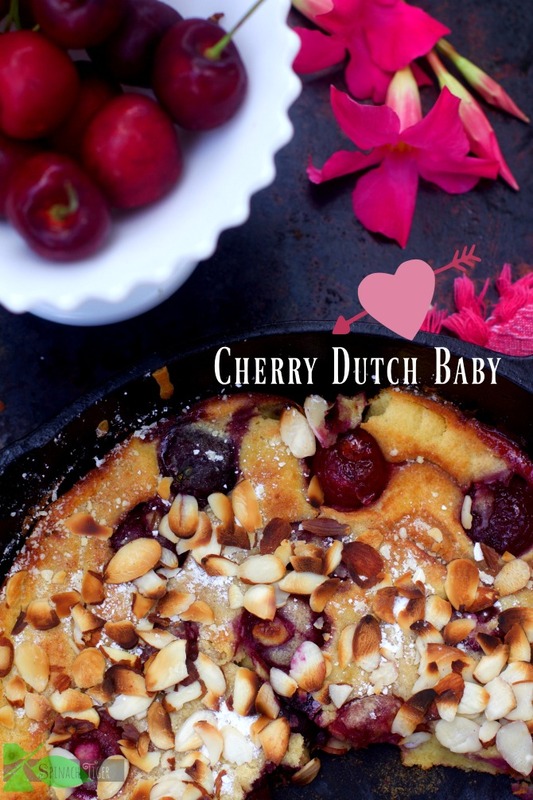 Cherry dutch baby topped with almonds is a perfect summer comfort food brunch. Combine flour with sugar, salt, baking powder. Combine eggs with vanilla and mix with flour. Add milk, and mix. Set aside. Melt two tablespoons butter and add to the mixture. Melt 2 tablespoons butter in 10 inch skillet that you will be making the dutch baby in. (Oven proof). Add cherries and amoretto. If you don't have amoretto, you can use brandy, or skip. Cook on low for 5 to ten minutes, stirring frequently. Pour batter on top of cherries. Add almonds. This may not puff up the same way regular floured dutch babies do, but will taste good. Thanks, Katrina. I hope you love it as much as I did. Question, getting ready to make this, it says 4 T. butter, but the recipe instructions only say what to do with 2 T. Are the other 2 T. mixed in with the batter? Ooh, I will make this! Love everything about it,, especially the GF.